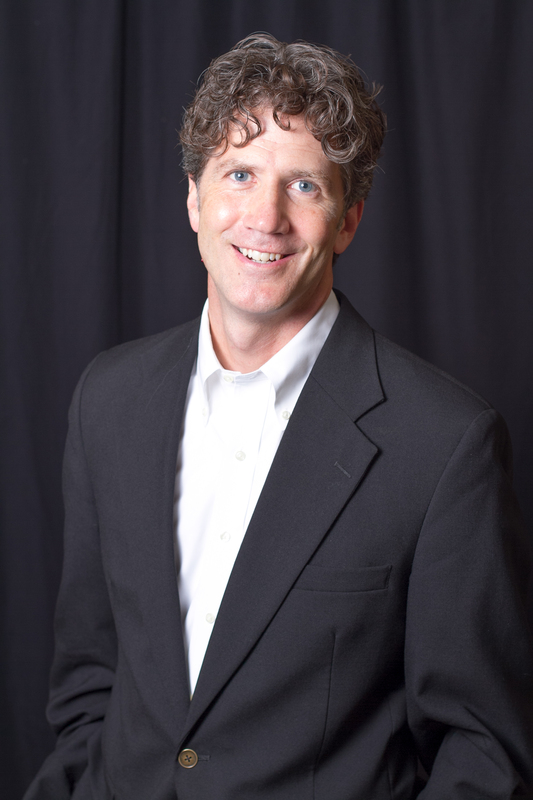 Last week “1070 THE FAN” began simulcasting – 24 hours a day, 7 days a week of all weekday prime time shows and evening & weekend play-by-play coverage – on a new dial position of 93.5 FM. 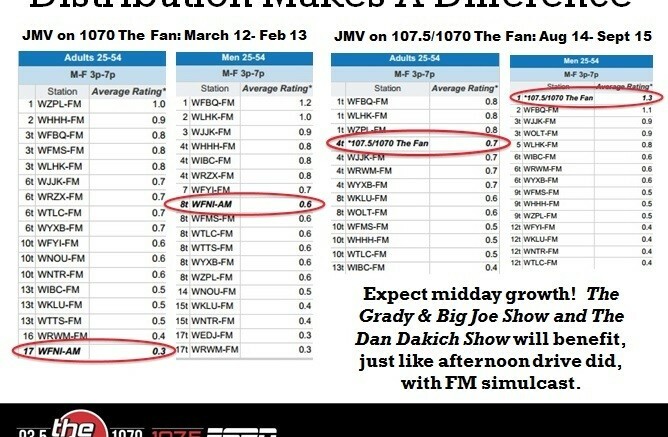 The AM/FM simulcast programming of THE FAN remains the same and will register in Nielsen ratings surveys as one station with the call letters “WFNI”. 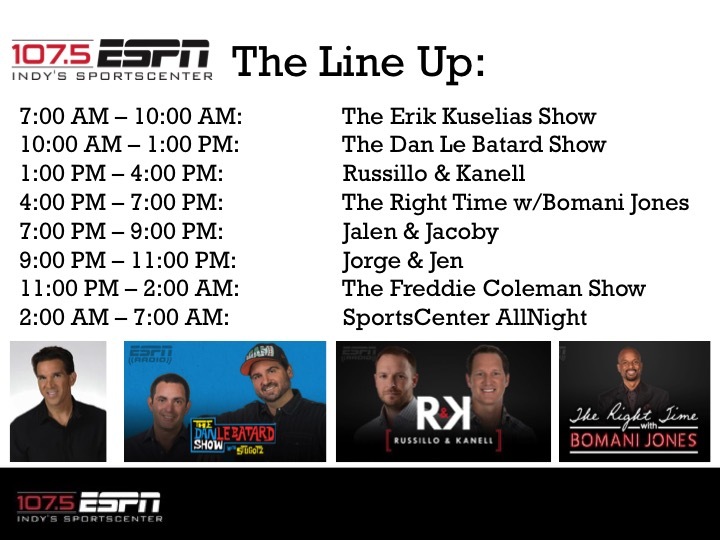 107.5 FM, which had been a partial mix of 1070 programming and national ESPN radio content, is now “107.5 ESPN” airing the national ESPN Radio lineup with the exception of Mike & Mike in mornings which will remain part of 1070’s simulcast, with 107.5 will substitute NBC Sports Radio’s Erik Kuselias in that slot. 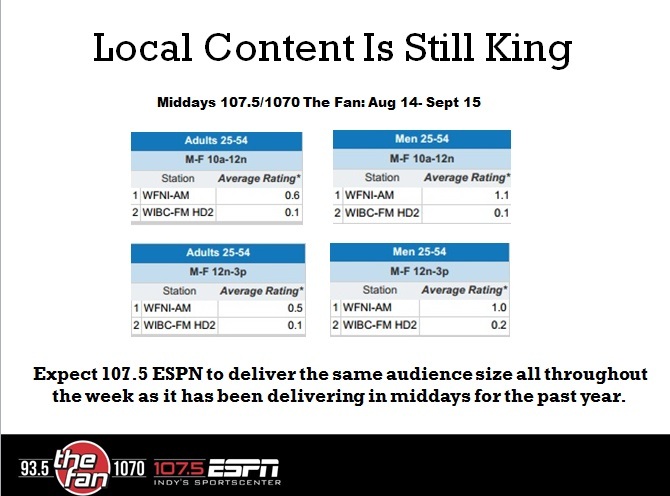 The FM frequency that since going on the air in the winter of 2013 sharing some content with THE FAN – both morning & afternoon weekday drive times, but not a complete simulcast – is now “107.5 ESPN” will show up in Nielsen reporting as WIBC-HD2; or in select systems a BIBC-FM. 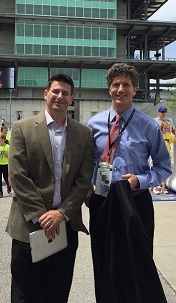 Play-by-play from all major Indy area sports entities, along with national event coverage by WestwoodOne Sports and NBC Sports Radio, will be featured whenever possible on both stations – 93.5 / 1070 the FAN and 107.5 ESPN. When there are local partner conflicts, coverage will be split among stations. 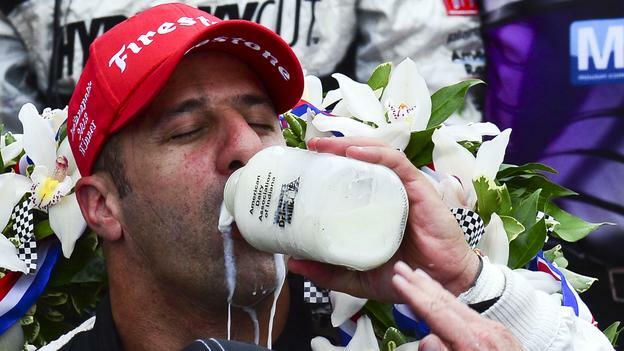 This is the same as it has been in the past. 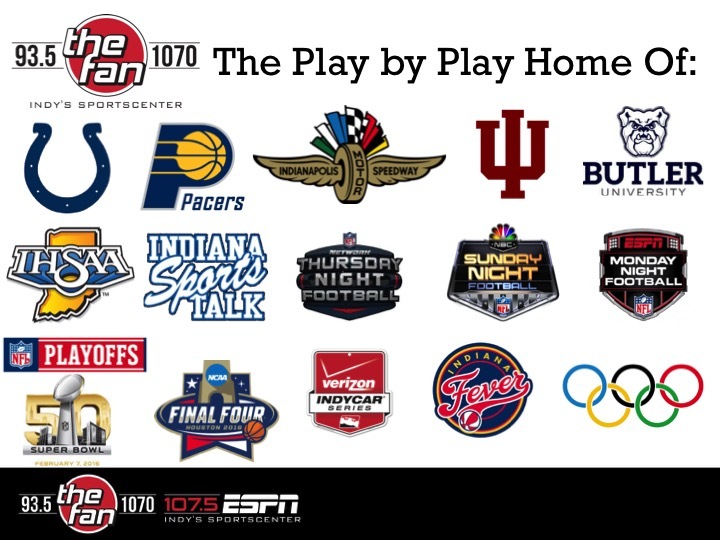 Local partners likely to have some broadcasts air only on 107.5 at some point are the Indiana Pacers, IU football games and the basketball coaches shows, Butler University basketball games, Indiana High School Athletic Association football & basketball games, select Indianapolis Motor Speedway events, and some events covered by nationwide syndicators. The signal pattern of each frequency is strong. 1070 AM has one of the best AM signals in the Midwest 50,000 daytime and 10,000 watts nighttime. 93.5 FM and 107.5 FM signals are nearly identical, as each radiates from the same broadcast antennae tower. 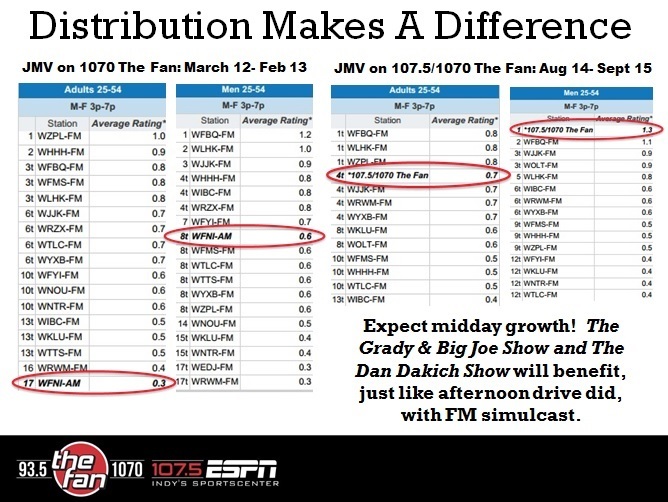 And ESPN Radio audience sizes in Indy should hold stable to what they’ve been.